When games or practices on the League’s fields are cancelled due to inclement weather, a message will either be put on the League Hotline 908-823-0566 by 4:15 pm that day or “closed” signs will be placed on the fields. 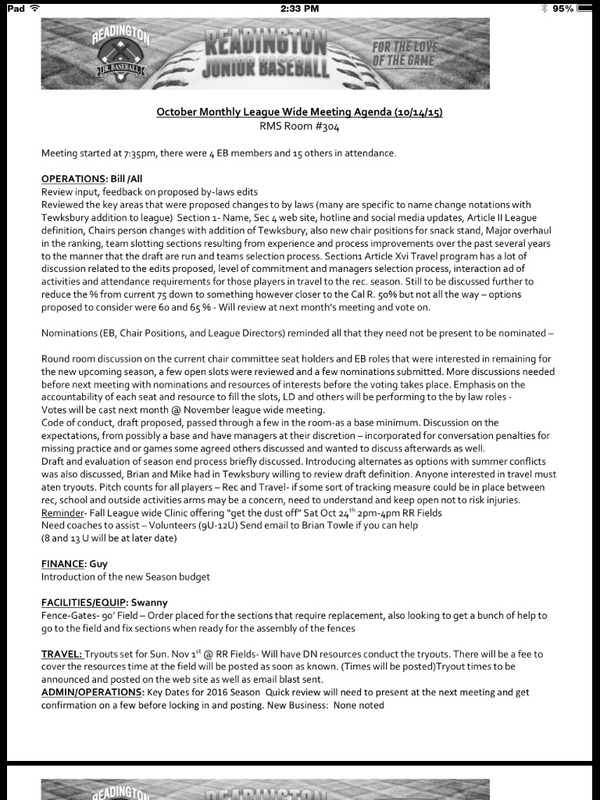 Email & text blasts will also be made simultaneously to League members, managers and coaches of field status and/or closings. Any problems viewing the above video on this site, try this link. Travel managers pay cash at the game. Rec managers do not pay at all. 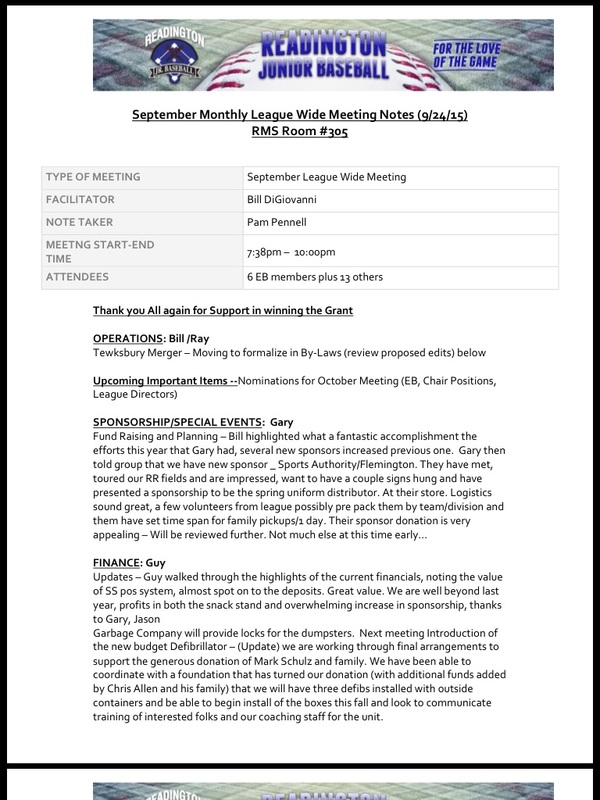 The league will get invoiced later. For the Rec league we will have one ump at all divisions except M70 and BR. Travel managers can request either. Any overall issues please contact RTJBL Chief of Umpires at RTJBLUmpireChief@gmail.com. If an ump does not show up please let us know, so we are not responsible for paying them. Click on calendar on website to view locations for the Rutgers Safety Course. Mike H: financials...we are on target. Revenues a little lighter with no Memorial Day tournament. If you have extra umpire money please return. John F: Dinner dance was a success--raised $2700. Sponsorship in excess of 23K, Plaques will be here in a couple of days. We will send out thank you cards. Will give Melissa May a game ball and invite her to golf outing dinner. Raffle tickets to be picked on June 16. Golf outing on June 11 with various prizes available. 53 golfers so far (38 paid)....BBQ and beer. Make dinner if you can't play golf. Shotgun start at noon. Tom also mentions importance of golf event to the league. Tom M: background check not implemented in time for 2012. We will offer refunds for those who paid. Talks about injury that took place on the field three weeks earlier at a game. Summer tournament slowly coming along. 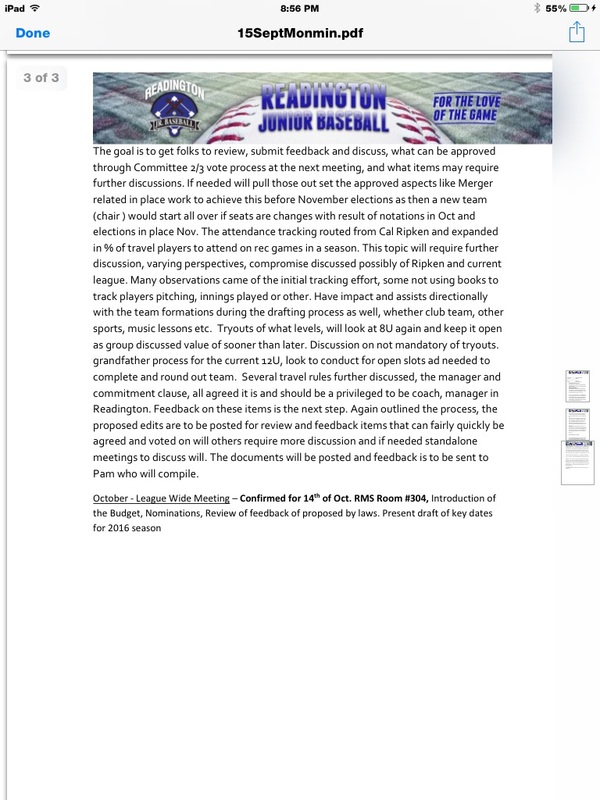 4 teams registered at 8u and 12u. We will host 11u districts. Major 70 teams helping out HOPS program. Everyone has enjoyed it and virtual 100% attendance. Forming an ad hoc committee to discuss various aspects of the program. Swanny: Apologizes for Cirnhuskers. Town dropped ball on it. If you have games, plan on helping with field preps. Talks about pitching mound plugs. Should be either on top shelf of home dugout or in shed. Be dilligent on cleanup. Branchburg has electric machines. Our budget is reason why we have manual ones. Garbage was finally picked up today. Some discussion about plugs for the mound. Some kids have been doing "donuts" in parking lot and fields. Outfield gates have chains but are movable. Tom: Thanks all for cleanup of bathrooms and fields. Tom Agello of FBA (an umpire) has requested use for his team to use our 90 foot field. If anyone is interested in summer ball and clinics let us know. There will be an 11u travel league playing at RR. Discussion to upgrade Babe Ruth shirts. Need a new tree at the "Love of the Game" sign. Dennis O'Neill talked about umpires. No problems. Tony Woods talked about success of Babe Ruth 16-18 team. -Tom M opening remarks...we accomplished more with less. Successful Little Sluggers program. Swanny by 9/24. We are looking at software package for league administrator to have launched by Jan. 2013.
board positions will take place next month. Travel tryouts will be held on Sunday October 14 and 21.
fine. Need to repair sheds. Soft-toss areas are shot. People are stealing aluminum signs. Brian Mulvaney mentioned that a parent offered to paint the snack stand. young kids out of snack stand. Workers have been good about not overmaking food. -John F mentioned dinner dance upcoming on Friday. Picture day Saturday May 12 with a rain date of 5/19. Golf outing on June 11. 36 have paid so far. Looking for help with prizes. -Tom also mentioned that picture day is Grandparents day. -Tom mentioned that there is a delay in the background check. Stay alert for update. -Tom:Opening Day was a great success. -Tom:Dan Morigello will do a clinic later in the year. -Tom:Nitin doing a great job with Rookie-1. Babe Ruth opening Day was April 21. Pitch/Hit/Run on April 27 was a success. Parade coming up on May 28. Looking for volunteers to run it. -Tom:Trophies this year will be given to minors and below. Home run trophies will be given to players who hit their first HR. -Rich: Summer Tournament is alive. -Swanny: facilities look great. Managers have done a good job with cleanup. Snack stand must be locked. Responsibility list is posted in snack stand. Tabs on mound must be put in. Liners need to be replaced. Recycling needs to go in recycle bin. Garbage goes inside. Call me if any maintenance issues. Bullpen mound is missing! -Tom: pesticide spray on Monday. Little Sluggers had to cancel. Rec dept will now send out updates daily on cancelled games. -Guy Francfort mentioned that ump showed up looking for gear. Tony Woods mentioned an ump being "dressed down". Also some discussion about the schedule. Minor scheduling glitch corrected. Much discussion about the umpires. -Mike Hickey had idea to state that last month's minutes be posted and no need to read. For those of you that would like a really easy way to keep track of you child's schedule and any last minute updates or changes. Download the Sports Ngin App. It's free and with this short video and or PDF we will walk you though how your smart phone can help keep your schedule organized. Click the link below, or you can watch it on this page below. REGISTRATION Is REQUIRED - Please read the details thoroughly once you click the link that brings you to the Rec. 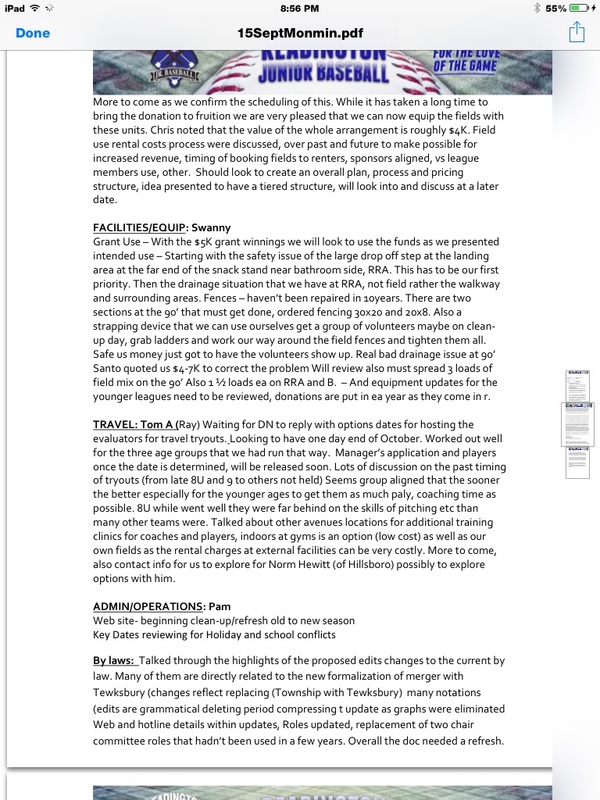 site as they are different based on whether or not you coach a Recreation sport in addition to Baseball in our league.